Africa has been in the limelight for the wrong reasons, when it comes to health. The deadly Ebola virus has ravaged parts of West Africa, leaving over 5,000 deaths to date. The sheer unpreparedness of the continent to handle this large scale epidemic has been played out on the world stage. Yet technology has had some major victories over this grave situation. Nigeria was able to contain and prevent the spread of the disease in its populous country through the application of tech. During the International Telecommunications Union ITU 2014 Plenipotentiary Conference (PP-14) in Busan, Republic of Korea, Nigeria’s communication technology minister Omobola Johnson commended the use of social media and an Android app. The Android app developed by eHealth and Information Systems Nigeria, helped health workers to report the onset of symptoms. According to Johnson, the use of this reduced the reporting time of infections by 75% therefore helping to contain the spread. Social media groups and Twitter handles under the name Ebola Alert also helped to distribute information on the virus. Other technology companies such as Facebook and Google have also donated their resources to fight the epidemic. While IBM has weighed in with its own Big Data initiatives in Sierra Leone. But Ebola is not the only instance where Africa has embraced technology in fighting epidemics. 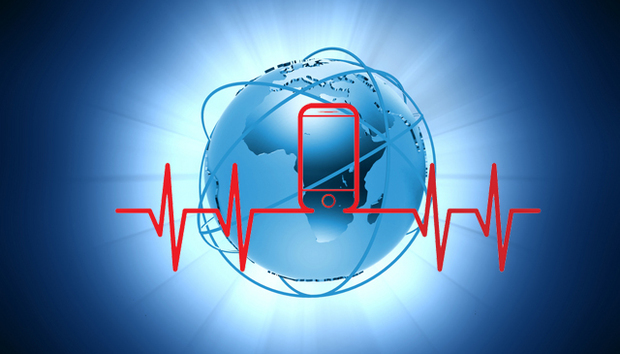 Beyond Ebola, other initiatives that incorporated technology in health have been slowly turning their gears. Currently, there are several notable mHealth initiatives helping to reach out to a wider group of people. TotoHealth, a Kenyan mobile service has been offering text and voice services on child health to women who are expectant and/or new mothers. “TotoHealth is setting off on a journey to revolutionize detecting disabilities with a simple idea. [This is to] monitor sets of TotoHealth’s SMS-based indicators of growth abnormalities and allow guardians for the child to report against the indicators,” Felix Kamaru, the founder and chief executive officer said. Kimaru sees the growth of mHealth in Africa as a way of addressing barriers that are seen in traditional health systems. Firstly, the explosion of mobile phone penetration across the continent offered a big opportunity to bring services such as health closer to the community. Most mHealth services help in sending out messages on various health issues hence improving the awareness even to rural areas. Organizations such as Village Reach, helps rural people in sub-Saharan Africa to access health using technology and also trains local health workers. Secondly, Kimaru notes that mHealth has been able to reduce the cost of accessing services such as insurance. Here companies like Changamka enable users to pay insurance through their mobile phone in small quantities. This reduces the processing fees and time. Safaricom, the biggest mobile company in East Africa also launched its Linda Jamii product that sees users get cover for themselves and their families for as little as Kshs 12,000 per year (US$140). Premiums can be paid in small installments using mobile money. Thirdly, mHealth initiatives also target the hospitals in trying to manage patients’ records. SMS for Life, is an example of services that can help in supply chain management. Low drug stock is a problem in many rural hospitals and keeping track of usage alone can be a life saver. In Sub Saharan Africa, lack of funds is usually an impediment to social enterprises such as mHealth initiatives. “Maternal health and health in general is majorly funded by grants. We have made huge strides as far as health is concerned but the challenge is sustainability. Most of the solutions and initiatives within the health sector are not sustainable,” Kimaru explains. ‘Who pays the cost’ has always been a challenge for most technology service providers. Do you charge the patient or do you charge the doctors and hospitals? It truly depends on how the business model is structured. While charging hospitals on supply chain management software is probable, charging patients for the services must be approached with great caution and sensitivity. The service is supposed to bring down the cost of certain health services hence making it more accessible. Another glaring challenge that Kimaru sees is the mentality the public has over health services. Not many people are taking it as their own responsibility. “Preventive health in third world countries is still far from being realized. This is because in third world countries there is a perception that the government or NGOs are responsible for the health of its citizens,” Kimaru says. Once everyone accepts that good health is in their own hands, then many of the services, such as health insurance, would have numerous subscribers in sub-Saharan Africa. Health bodies both private and public need to shout louder on the options that are there for the people. This awareness drive will ensure that more people enroll in such services. Yet great milestones are also being reached on the continent. In November this year, IBM’s Watson computer went live in Metropolitan Health Hospital in South Africa. “With the growth of mobile phones on the African continent this new platform will help many who in the past did not have access to enhanced health services. IBM Watson is helping to connect, support and develop Africa in ways that are unique culturally and individually,” IBM said in a statement. Such cognitive technologies help doctors and scientists make sense of Big Data. Hospitals host megabytes of data, which is currently only being used to refer to past cases. Such data can now be used to make decisions and point to changing trends in the health sector. Today the continent has all the tools to fight ongoing epidemics such as malaria. It is time all stakeholders start learning technology lessons from the Ebola outbreak to map out the health sector for the future. « WiFi Direct v Bluetooth: Which Will Win?